A prolific, popular group for 16 years, Weezer must be aware that fans cite their 1994 self-titled debut and its 1996 follow-up, Pinkerton, as their best works. 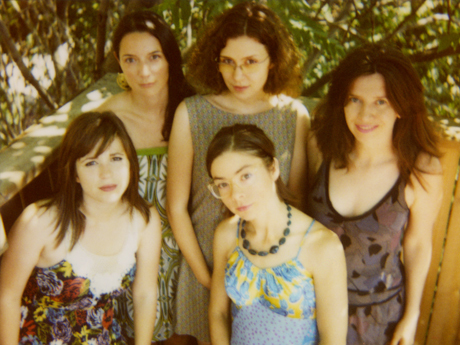 The women in Toronto's Sheezer concur, basing their cover band solely on that era, while gaining approval from Rivers Cuomo himself. Sheezer is Laura Barrett, Dana Snell (Gentleman Reg), Magali Meagher (Phonemes), Robin Hatch (Sports: The Band), and Alysha Haugen. Custom made for fun, Sheezer's a labour of love. "Laura and I were listening to the Blue Album, and geeking out on it with superlatives like 'It's the best album ever made!' and 'I know,'" Snell recalls. "We talked about forming a Weezer cover band, I thought of the name Sheezer ― at least I think it was me, it might've been her ― and then we knew we had to do it." Cuomo's renowned for his lustful longing for female companionship, so hearing Sheezer tackle his material is fascinating. "It's an interesting '90s conceit because that's when it was a big deal if you were a 'girl band,'" Snell explains. "I don't feel like that exists any more. And every guy and his bro have covered Weezer at some point, so this is a fresh take on it." Cuomo has tweeted about Sheezer and recently gushed online about a close encounter at Montreal's Osheaga Festival. "A friend of mine ran backstage with some Sheezer pins and saw Weezer get into vans," Haugen says. "He calmly poked his head into one and said, 'Hey Rivers, I have a gift for you from Sheezer.' Apparently Rivers' eyes lit up with recognition and he said, 'Sheezer, oh cool!'" "My personal goal is to open for Weezer on a tour," Snell says excitedly. "Me too," Haugen enthuses. "Aim for the stars!"